Summit LIV Medicated Hair Revitalizer ULTRA Thick Anti-Thinning Formula is a light oil that penetrates and lubricates the scalp. This provides nutrients to the hair which reduces and increases softness, shine, manageability, and encourages healthy hair growth. 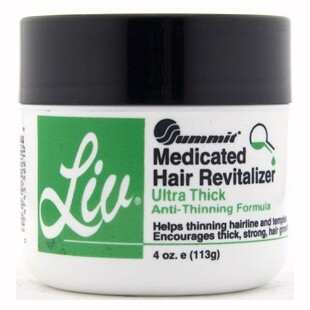 LIV Medicated Hair Revitalizer ULTRA Thick Anti-Thinning Formula aids in thickening the hairline and temple areas. This extraordinary hairdressing is excellent for all types of hair.